Far Cry 5 Post Launch DLC Announced | Nerd Much? With Far Cry 5 just a few weeks away, Ubisoft has begun detailing what we can expect after the game’s launch. And it turns out there is quite a bit coming our way. The core portion of the Far Cry 5 DLC is comprised of its three side adventures: Hours of Darkness, Lost on Mars and Dead Living Zombies. Hours of Darkness thrusts you into the heart of the Vietnam war. Here, you’ll have to fight your way through enemy soldiers, rescue various POWs, and get you and your squadron evacuated amidst the chaos of war. In Lost on Mars, players are sent to a futuristic version of the red planet. You’ll be given jetpacks and advanced weaponry as you are tasked with thwarting the alien invasion taking place on the planet. And finally, Dead Living Zombies puts you right in the midst of a cheesy horror film put together by an actual B-movie director. You’ll join up with a co-op teammate as you tackle seven different scenarios that are thrown at you featuring various forms of the undead. While the three DLC drops above are meaty, Far Cry 5: Arcade looks like it could be something special too. Ubisoft describes the mode as “the evolution of the map editor that will deliver an endless amount of free gameplay and map creation opportunities for players.” Those inclined to create can put together solo, co-op and PvP multiplayer matches. And it turns out you won’t just have Far Cry 5 to choose from. Players will also have access to assets from older Far Cry titles, as well as materials from Assassin’s Creed IV: Black Flag, Assassin’s Creed Unity and Watch Dogs. In addition to all of the above, Far Cry 3: Classic Edition is also being thrown into the package. And Ubisoft says that they will be featuring Live Events for Far Cry 5 too. Completing these Live Event challenges will award players with cosmetic items like vehicle and weapon skins. While we know Far Cry 5 is launching on March 27th, we don’t know when its various DLC pieces will be dropping. 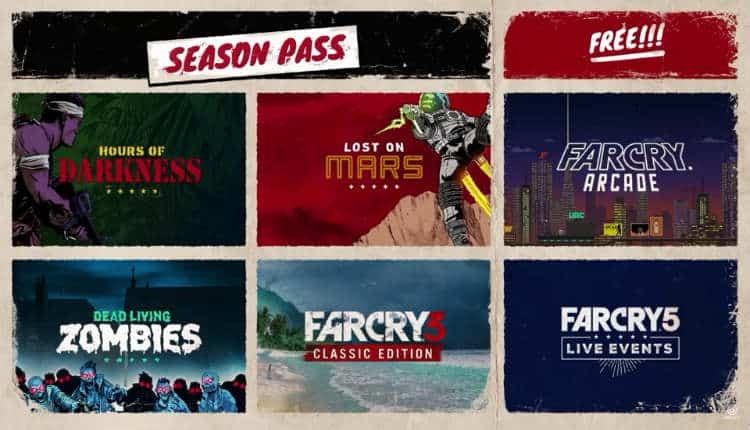 You can purchase them all via the game’s Season Pass. However, pricing on that has yet to be revealed. You can pre-order Far Cry 5 on Amazon or at Gamestop.